Tonight (November 25) marks the return of one of Toronto's favourite unofficial holidays — Drake Night. The Raptors' global ambassador will return to the Air Canada Centre for the event's third annual instalment this evening, and the Drake-inspired evening is taking things up a notch with the debut of a "Hotline Bling" booth. While black-and-gold OVO and NBA crossover swag is a given — this year fans will be treated to long-sleeved shirts and headbands — the video recreation cube is a new addition for 2015. Attendees will be able to bust their moves in a replica of the glowing, rainbow-coloured box from the viral video. 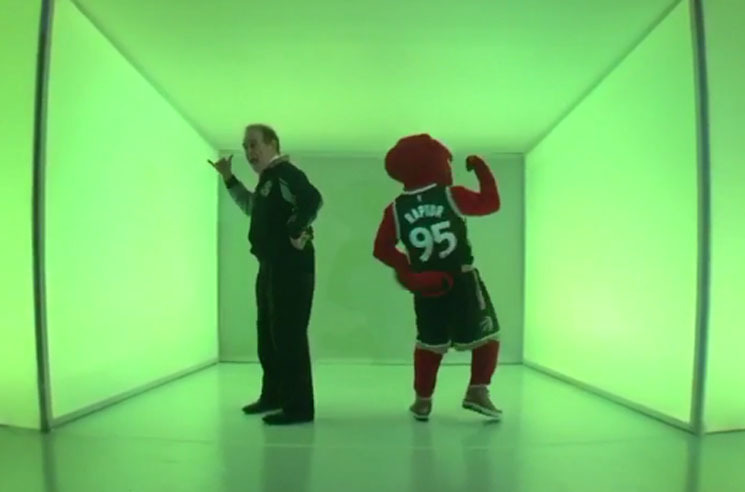 The set has already been tested by the Raptors' mascot and Toronto city councillor (and noted Drake supporter) Norm Kelly. Watch the results from their screentest in the Vine clip below. The Drake Night basketball game pits the Raptors against Lebron James and the Cleveland Cavaliers tonight at 7:30 p.m. EST. The "Hotline Bling" cube will be set up outside Gate 1 at the ACC until game time.